Till date, both the teams have each other 16 times in the IPL since its inception. Mumbai has won 11 games of those. Thus, they have an extra edge over the opponents. It can be considered as a healthy record against Knight Riders which has won the IPL title twice in the last four years. Kolkata is not going to make any changes as per the reports. Against Mumbai, they will come out with the same playing 11 as they did in their last match. The comeback of Sunil Narine has brought an extra smile for KKR camp. However, his entry in the probable final XI is doubtful as the spinner Brad Hogg is performing well. So, he becomes the preferred option for Gautam and the coach Kallis. “Winning is team game. We, individually, play a part and we have to do it to our best whenever we get our chance to play. Sunil’s return is good for the team. We expect each other to perform better under pressure as it is a good thing to bring best out of us. Also, it proves to be a respecful competition among us,” Hogg was quoted as saying by IANS. While, MI captain Rohit wants to bouce back and get on the winning side. They lost the last game against newcomer team Rising Pune Supergiants. The skipper believes that they have realized their mistake done in that match and will try to rectify today. “Past is past. It’s better to forget and learn from the mistakes we have done. We have learnt and will improve ourselves in the upcoming matches,” Rohit told. The MI captain Sharma is still on his way to find and make the best eleven combinations. However, he knows that it will some IPL matches to settle with the best one. “Every time, the first few games are always challenging because the team players need to get settle down and understand each other and then play as a team together against every opponent team,” Rohit added. 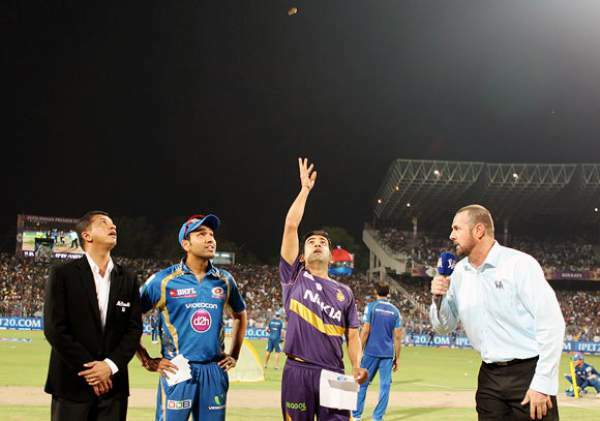 KKR v MI is to start at time 8 pm IST (10:30 am ET). In India, TV channels Sony Max, Sony Six, Sony Six HD, Sony ESPN, and Sony ESPN HD will do the live telecast. MI v Kolkata match will be streamed on StarSports.com and HotStar. The American audience can catch the updates live on ESPN, and it will be live streamed on Watch ESPN. While in Canada, Sportsnet and WatchSportsnet are there for watching on TV and online respectively. The UK audience will be able to catch it on Sky Sports 2 / HD2. They have the option to stream it live on Watch Sky Sports and Sky Go. The viewers residing in the Middle East and North Africa can watch it on OSN Cricket Play and OSN Sports. SuperSport will broadcast it in South Africa and Sub-Saharan Africa while KKR vs MI Live Streaming will be available at SuperSport Live Video in the abovesaid regions. The rest of the World can watch it on CricketGateway. Stay tuned for Kolkata Knight Riders vs Mumbai Indians live streaming, IPL T20 score, match result, commentary, full scorecard, and other details. Previous articleKumkum Bhagya 12th April 2016 Episode: Tanu plans a new controversy against Pragya; Gets support from Abhi !